This project uses contrast agents to increase the visibility of polyethylene for improved medical imaging, and assesses the clinical safety of new implants. Polyethylene is one of the most commonly used polymers for medical implants and devices. The global market for medical polyethylene is increasing. It is predicted to reach $1.36 billion by 2024. Polyethylene is used extensively in joint replacement implants. And over 100,000 polyethylene hip and knee replacement operations are performed in England and Wales each year. It can also be used in replacement ligaments, maxillofacial reconstruction implants, surgical sutures and meshes. More recently, it has been used as an alternative to metal wires when treating bone fractures. The electron density of polyethylene is similar to body tissue. This makes it hard to distinguish when using X-ray-based imaging methods such as CT, fluoroscopy and radiography. This severely limits the clinical follow up of polyethylene devices. It means it is not possible to see the position of an implant after surgery. So, if the implant moves, breaks, or is not performing as intended, the surgeon cannot identify the issue from a routine X-ray. It also means it is not possible to use imaging tools such as fluoroscopy during the operation to aid implant positioning. This is a particular problem for polyethylene maxillofacial reconstruction implants . Understanding the influence that the iodised oil has on the material properties under different treatment conditions. Understanding the longevity of the implant. Using mathematical modelling and simulation studies to accurately represent the diffusion of the contrast agent. This is essential for identifying treatment parameters for different geometries. Treating real joint replacement components and using clinical imaging equipment to create representative scans. Clinicians will be surveyed to identify the ideal ‘brightness’ of the polyethylene in the X-ray image. Investigating the feasibility of measuring polyethylene component wear directly from the treated polyethylene component. This will be in collaboration with Dr Bart Kaptein in the Department of Orthopaedics at Leiden University Medical Centre (LUMC). 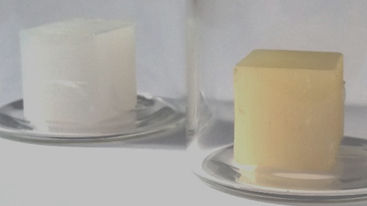 The work performed to date has identified a safe window of treatment conditions that do not significantly change the material properties of the polyethylene. Preliminary work has been performed to create mathematical models of the diffusion. Further work is planned to refine the model. References:  Zielinski, et al. “Classical versus custom orbital wall reconstruction: selected factors regarding surgery and hospitalization” Journal of Cranio-Maxillo-Facial Surgery 45 (5) (2017) pages 710-175.